One of the websites I maintain is LotusElan.net. The website has a very active membership. Over the last 14 years, our members have posted over 21,000 images. These images are valuable, but are very difficult to find. This led me to find an image gallery solution that could be easily attached to the phpBB database. I examined numerous open source image galleries. I tested and implemented a gallery called UberGallery. This photo gallery has a very good code base. The product is built to read the files from a file directory. It was very easy to modify the code to pull the file information from the MySql database. 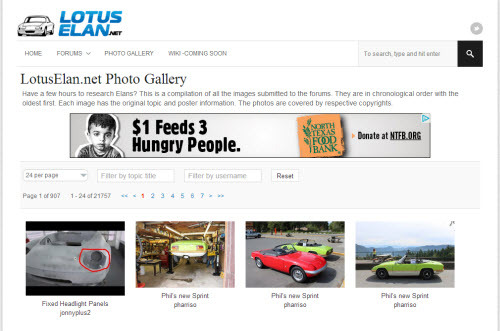 I would recommend this approach, if you are looking for an inexpensive photo gallery to attach to your phpBB forums. The drawback for me was the need for a search facility. With over 21,000 images, the need to filter is important. I am already using a great product called jPList on another project. jPList is a flexible jQuery plugin for sorting, pagination and filtering of any HTML structure (DIVs, UL/LI, tables, etc). The tool has great features. jPList can be set up to work on inline HTML or with server side code. With the large number of pictures, we implemented the server side module. The product provides example of server side processing, but are for php and SQLite. The server code example was very simple to convert to MySql. An ordinary php/MySql hacker can get this up and running in a couple of hours. If you are good at php/MySql, you will be up and running in about an hour. Additionally, we added a lazy loader for images. As you can image a webpage with 800 images will take a while to load. With the lazy loader, the page loads in about a second. As you scroll through the page, the lazy image loader retrieves the images as you need them. The software for this component is Lazy Load Plugin for jQuery. This has become a valuable addition to our phpBB forums. That is great. Any chance of releasing the mod? I would make a mod, but it would require the users to purchase a piece of supporting software. The cost is inexpensive (7USD), but would require a purchase.